Nhlanhla is one of the Zulu language’s most wonderful words. It really means “good luck”, but it also conjures good fortune, happiness, largesse and all the warm feelings we get when life is kind to us. Dubbed Nhlanhla by the Zulus who brighten our lives every day at Hartford, the name recalls the feelings of our team when they first saw Nhlanhla in its finished form. The suite radiates nature, the colours of our environment, warmth and originality, and as much as anything is a signal example of what the creative spirit can achieve from modest, locally sourced materials. The majority of the materials used in the erection of Nhlanhla were harvested off the greater Summerhill and Hartford estates, and where this was not possible, from our immediate environs. This suite was the most recent of four comprising the Ezulweni (“in the heavens”) eco extension to Hartford House’s colonial origins. The intention in juxtaposing the original Hartford homestead with Ezulweni, is to provide travellers with an insight, when they are in the manor house, of our region’s colonial past, and then to transport them through an intimate glimpse of what’s possible with a touch of imagination from our Zulu staff, whose creative hands are strikingly apparent in the finishes to Nhlanhla. In contrast to the rustic materials used in the development of the suite, the fine mahogany wardrobe housing the television and mini-bar, was imported to South Africa in the 1820’s and was acquired from a village in the Eastern Free State. The teak floors were rescued from the renovation of Durban’s “grand old dame”, the Edward Hotel, while the Indian front door was imported by Cheryl Goss when she was overseeing the renovation of what is now Lynton Hall. Internationally acclaimed for her work at Lynton Hall, Cheryl’s introduction of Indian antique furniture to that property recalls its association with the arrival of Indian indentured labour in Colonial Natal. 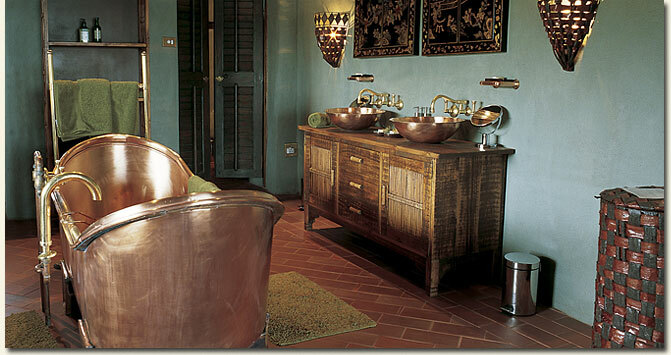 The copper bath is a creation of a customer of the racehorse stud, Summerhill, while the beds are from an altogether different age, featuring a hydraulically adjusted touch button (just below the mattress on either side), enabling guests to position themselves as their souls demand, after another “tough” day in Africa! Nhlanhla has become the suite of choice of His Majesty King Letsie III of Lesotho, ruling monarch of the Mountain Kingdom, during his visits to Summerhill Stud, where he keeps several horses which feed his and his nation’s passion for the equine species.